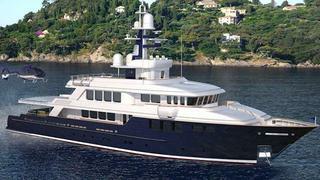 Josh Gulbranson at Fraser Yachts tells me that he is offering a huge price cut on the new 45.42m motor yacht Alpha. Originally asking $31.5 million, the rice has now been dropped by $20.5 million to now be listed for sale for $11 million. Built by Newcastle Marine to ABS class, she's currently about 75 per cent complete. Alpha boasts several features more common in larger yachts, including a touch-and-go helicopter facility. She features five staterooms including a full-beam master suite on the bridge deck, and she also has an elevator serving all decks. Twin 1,100hp Caterpillar engines give her a range of 4,000 nautical miles. Lying in Fort Lauderdale, Florida, Alpha is being sold 'as is, where is' and asking $11 million.